So you’re looking for answers to the latest Take A Break competitions? We’ll you’ve come to the right place. Whatever your reason, if you’re struggling with an answer or just want to sanity-check your answer so you have the best chance to win a great prize, then keep reading. Below you will find the most recent issues of Take A Break and details on their competitions alongside answers. The newest issues / comps at the top. You will only find competitions that are still open for entry – once the entry deadline has passed, the link will be deleted. Within each competition post you can discuss answers and suggest answers yourself. Good Luck! It’s pretty unlikely you found this page without knowing what Take A Break is, but if that’s the case, let me take a few sentences to fill you in… Take A Break is a weekly UK magazine aimed at women, full of real life true stories, health advice, home, travel and of course amazing competitions and prize draws. It’s one of the most popular UK mags and great value – currently priced at just 96p! The magazine became so popular, they also created a monthly bumper edition and occasionally you will find special editions. All of which have great competitions and prizes. 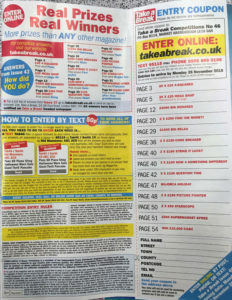 One of the biggest attractions of the Take A Break magazine is their competitions, prize draws and puzzles which readers can enter to win lots of small and large prizes ranging from holidays to vouchers. The competitions are throughout the magazine and take many different formats, from the traditional to the fun and funky. Readers can choose to enter all or some of the competitions via telephone call, text, post or online. Entry online is free and the most popular method. 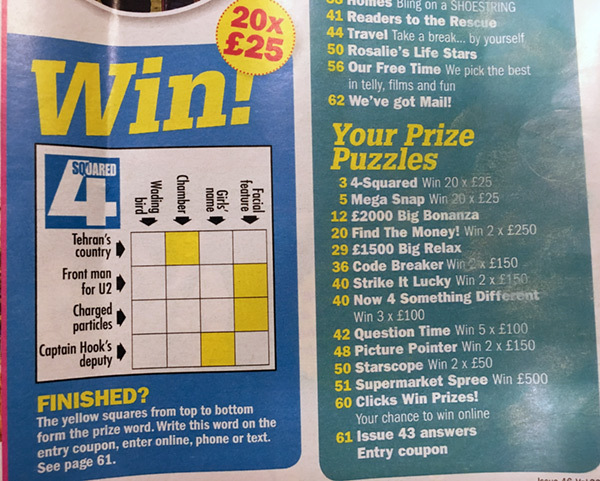 There are many comps throughout the magazine, each with a different prize to win and some offering multiple prizes – for example one competition could have enough prizes for 5 winners. 4-Squared: provide the 4-letter answers to fill a 4×4 grid of letters, use the highlighted squares to find the answer word. Mega Snap: a partial photo is supplied, you have to find the complete image in the magazine and submit the page number as your answer. Strike It Lucky: search the letter grid to find the connected words. The remaining letters form a final word – submit this as your answer. Question Time: you have a list of 21 questions and 20 answers. Stroke the answers off and submit the remaining answer to enter the competition. The prizes vary from competition to competition. Most comps have a total prize value of around £500. The number of winners for each prize can vary from 1 to 20, for example 1 winner of a £500 prize or 20 winners, each winning £25. Usually there are also 1-2 larger prizes to be won such as a holiday or cash prize worth in excess of £1,000. And, more recently, Take A Break have been running large puzzles with a £10,000 prize – the biggest in any UK magazine! Each puzzle you solve results in a one-word or numerical answer. These answers must be submitted before the closing date. You can enter as many or as few competitions as you like. The closing date is approximately 10 days after the magazine publication date. Complete the entry form coupon at the back of the magazine, place it in an envelope and post it to the supplied address. Make sure you put a postage stamp on the envelope and allow enough time for your entry to arrive before the closing date. Call the number provided at the back of the magazine on the entry form and provide the required personal details alongside your answers. The current cost is 50p per minute. At the back of the magazine you will find a number to text and a TAB code (the issue number eg TAB46 would be for answers to Issue 46). You need to input your name, house number and postcode, then a list of answers. We think this is quite futtery…and seeing your reading this page, your probably more interested in online entry so we’ll not go into any more detail on text entry! The best method in our opinion is to enter the Take A Break competitions online. It is completely free and very easy. Simply visit the Take A Break competition page for the issue you wish to enter and submit your personal details and answers. At TVComp.UK we provide our suggested answers and also provide a place for you to discuss and suggest answers (as sometimes it takes us a few days to go through all the answers – you might be faster!). Winners can feature in the Take A Break mag! At the back of the magazine you’ll find a list of winners from an earlier issue, currently this is 3 issues earlier. A full list can always be found on the main Take A Break website. Please do take time to read the magazine and challenge yourself with the puzzles and competitions. If you’d like to sanity-check your answers then check our post whereby we provide our suggestions and have the facility for you to ask questions or provide answers yourself. Good luck in the Take A Break competitions – and very competition you enter!